George Frideric Handel, born in Halle, grew up as the son of a barber-surgeon who wanted his boy to study law. Young Handel successfully rebelled, and by 1703 was playing violin and keyboard in Hamburg’s opera orchestra. Handel spent four years it Italy (1706-1710), where he moved amidst the musical elite of the day – meeting Corelli, Scarlatti, and Pasquini – and received the nickname “il caro Sassone” (the dear Saxon). According to historian Paul Henry Lang, Handel learned more from Italy than its musicians alone could teach. 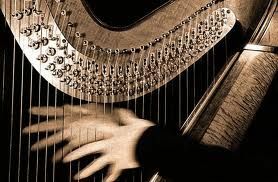 He learned from the Renaissance paintings that there is a “disciplined passion [in] the resolution of powerful conflicts,” and his later music reflects the search for the auditory equivalent. For much of his life, Handel lived as an Englishman, and his greatest works belong to those years, including the operas Orlando (1733) and Alcina (1735), both dramatizations of Ariosto’s Orlando Furioso, and the oratorios Messiah (1741) and Jeptha (1752). Handel's Suite for keyboard were first published in Amsterdam in 1719 by Jeanne Roger. But because Handel received no royalties from Roger, he understandably decided to publish them himself in London the following year. 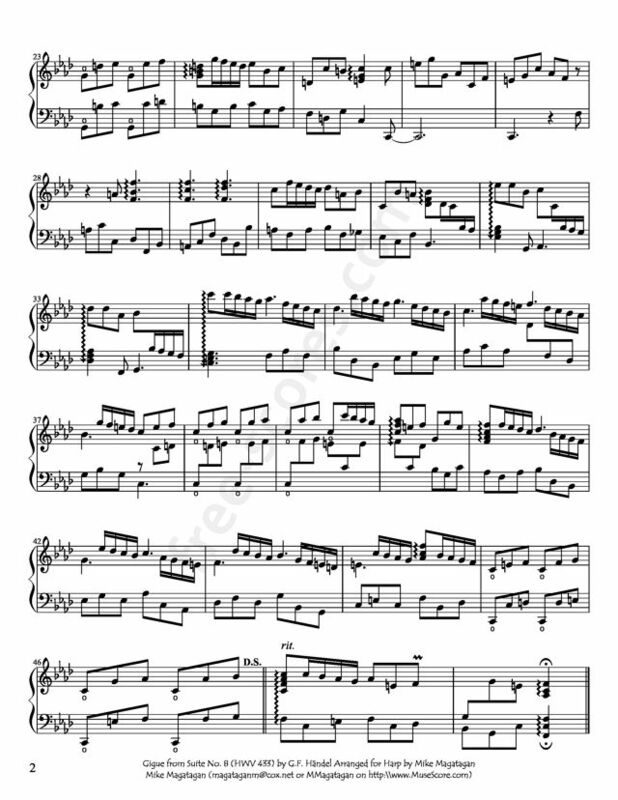 Also called Suites de pieces pour le Clavecin, the suites are most often sets of stylized dances, occasionally including further additional movements. Although originally written for Keyboard, I created this arrangement for Concert (Pedal) Harp. 1 scores found for "Gigue from Suite No. 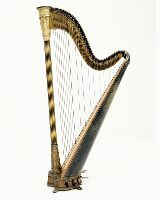 8 for Harp"